We’re already a week into fasting and I have to say, it’s so far one of the easiest Ramadan months I’ve experienced; despite the fact that we’re fasting just over 19 hours (from food, drink, and extra curriculars…if you get what I mean) every day, and we’re maybe getting 3 to 4 hours of sleep. Maybe. But I enjoy it so much. I love the challenges that this month gives me in terms of self-control; the time it allows for me to self reflect on things I need to improve upon, and the opportunity to think of others who are less fortunate. This aromatic dish is full of amazing goodness. The bone from the chicken flavors the rice more than I can describe to you on here. I added leeks, carrots, and raisins. 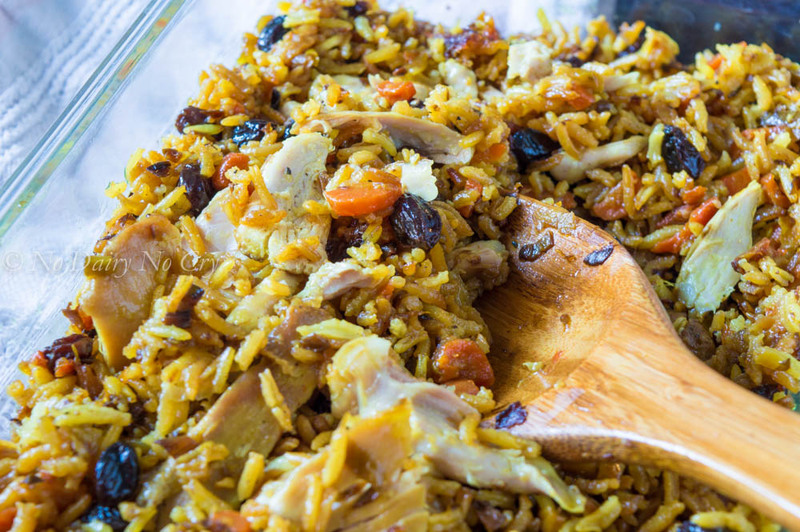 They all taste great with the rice and chicken, especially when you add the spices I’ve included in this recipe. You’ll have to make it and taste for yourself. All of your senses are engaged, allowing for a total mind-body experience. If you’re fasting, how is it going for you so far? Are you finding the long hours bearable? I want to take this time to thank all of you for your continued support. You make sharing my recipes enjoyable. If only I had more time to be on here and write more and more. 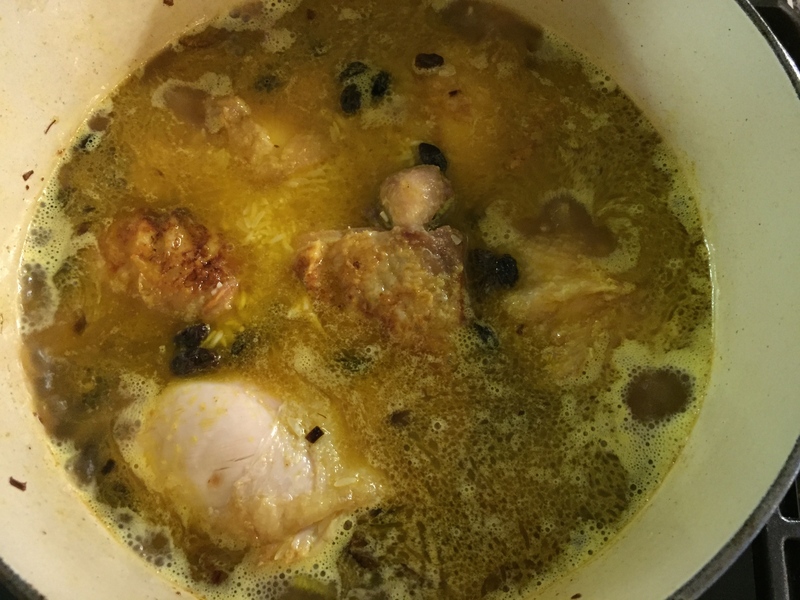 I’ll get there eventually ;) Until next time, enjoy making Chicken Biryani. And please let me know how you like it! 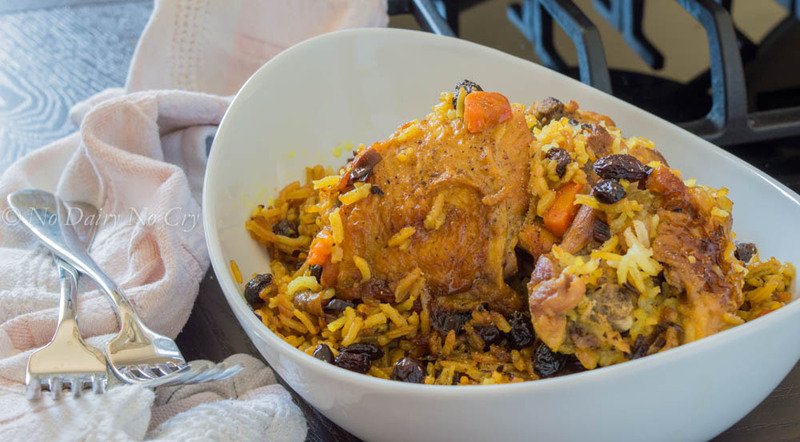 An infusion of flavors thanks to the cooking process which combines the chicken with the rice, and delicious spices. This recipe is a must make for its sheer simplicity. In a large pot, place oil and heat on medium high. 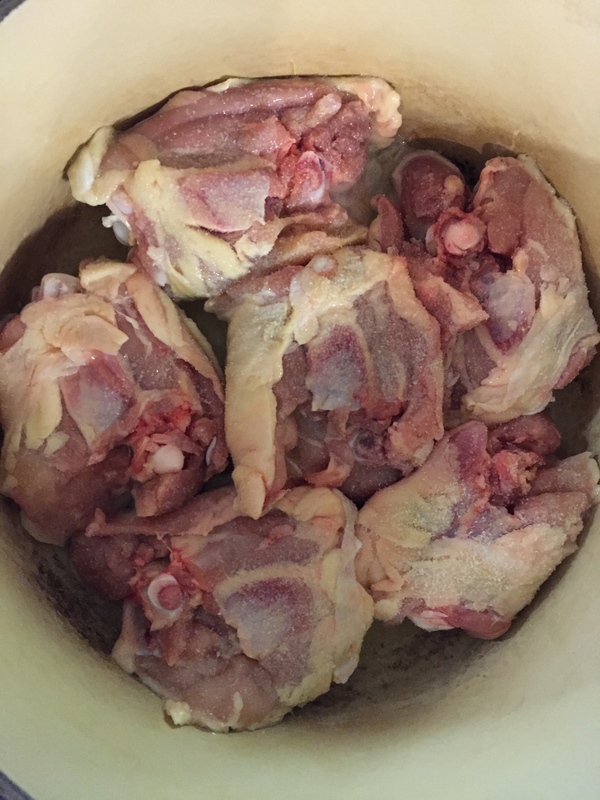 Heavily salt and pepper chicken thighs on one side and place in hot pot. Once skin is crispy - approximately 4-5 minutes, season other side with salt and pepper and turn chicken pieces over. Cook another 4 minutes. Remove from pot and set aside. 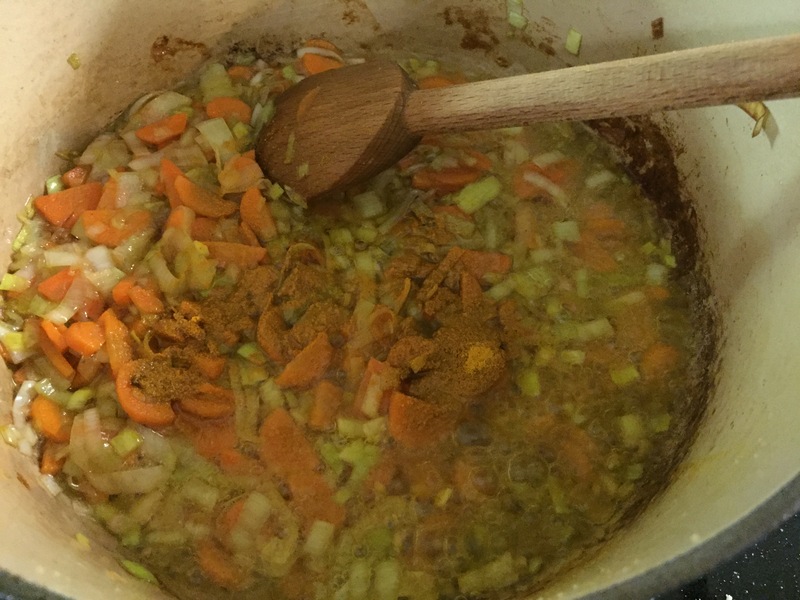 Next, turn heat to medium and cook chopped leeks and carrots, approximately 5 minutes. Add turmeric, nutmeg, and cinnamon, and mix with vegetables. 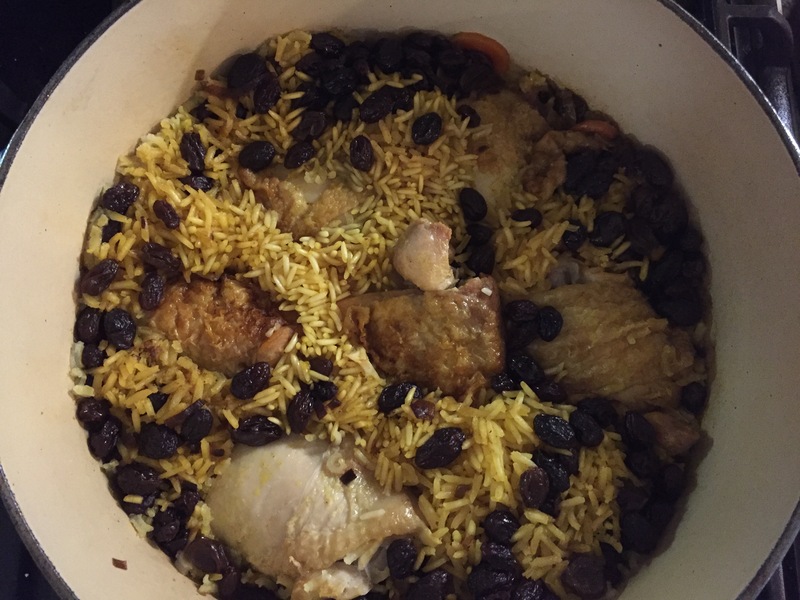 Return chicken to pot, and add rice, raisins, and water. Add sea salt (approximately 1 teaspoon) and pepper if desired, and stir until salt dissolves (a few times). 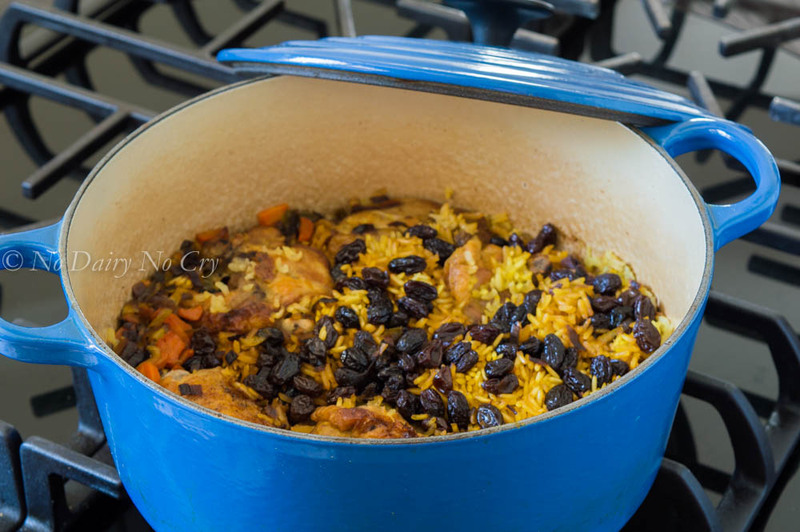 Cover pot, turn heat to lowest low, and cook for 45 minutes, or until the water has completely been absorbed by the rice, and chicken is fully cooked through. Debone chicken into pieces, and combine with rice. This recipe serves 4-6 hungry people. 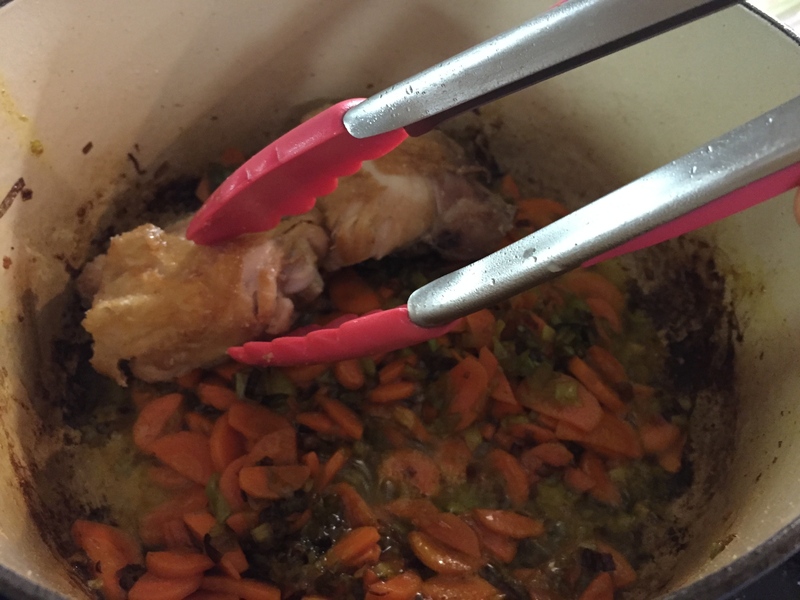 If chicken thighs aren't available, you can use a different cut - for example, 4 legs with backs, or 6-8 chicken legs. etc. Whatever you can fit in your pot without the chicken overlapping will work great. 1. In a large pot, heat oil to medium high. 2. Heavily salt and pepper chicken thighs on one side and place in hot pot. Once skin is crispy – approximately 4-5 minutes, season other side with salt and pepper and turn chicken pieces over. Cook another 4 minutes. Remove from pot and set aside. 3. 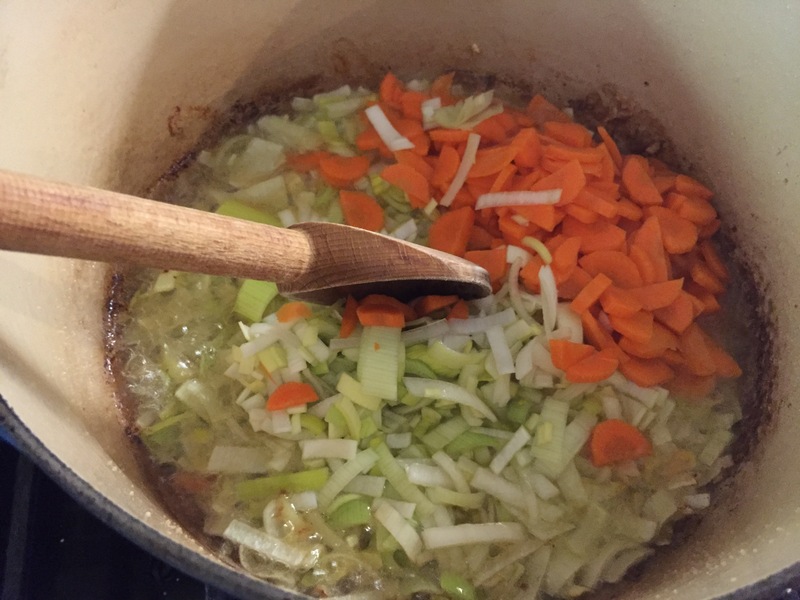 Next, turn heat to medium, add chopped leeks and carrots, and cook for approximately 5 minutes. 4. Add turmeric, nutmeg, and cinnamon, and mix with vegetables. 5. 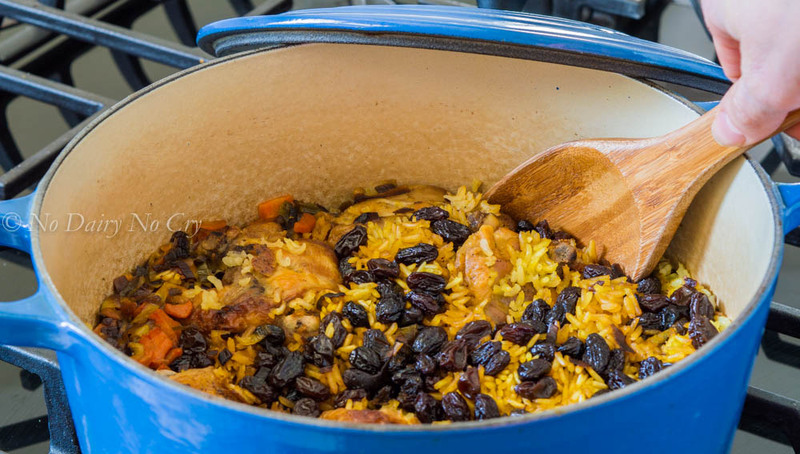 Return chicken to pot, and add rice, raisins, and water. Add sea salt (approximately 1 teaspoon) and pepper to taste, and stir until salt dissolves (a few times). 6. 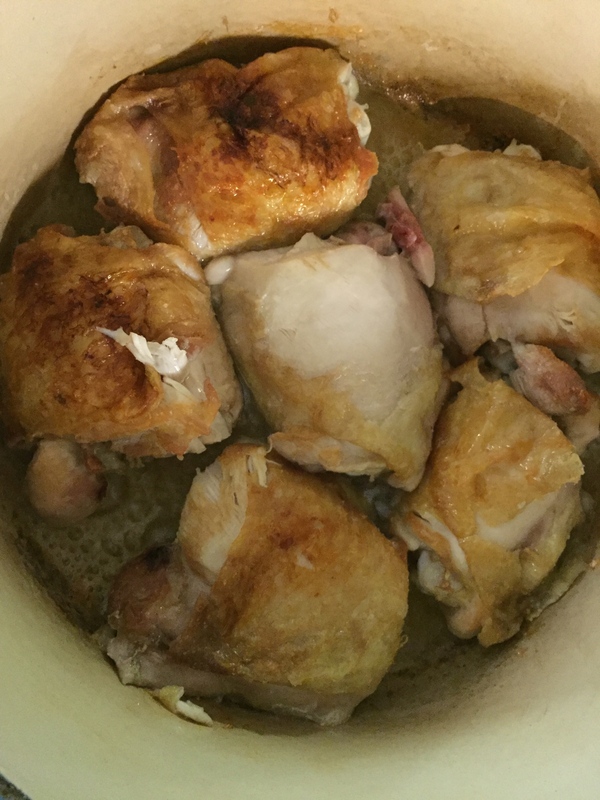 Cover pot, turn heat to lowest low, and cook for 45 minutes, or until the water has completely been absorbed by the rice, and chicken is fully cooked through. 7. Debone chicken pieces and gently mix chicken with the rice until incorporated. Bon appétit! This is a food combination that I normally wouldn’t think to make but it looks really, really good! Yum, I’m always looks for a good rice dish! This is one to try :) Thank you! This dish looks so delicious! Can’t wait to try it! This looks like such a comforting dish – I’ll definitely have to try this out. I love Biryani! This looks delicious!! What great flavors. Looks like a great meal to serve at a dinner party! Absolutely! What a great idea to serve this when you’re hosting a dinner :)) Thank you, Kelly! This is such a wonderful weeknight recipe! 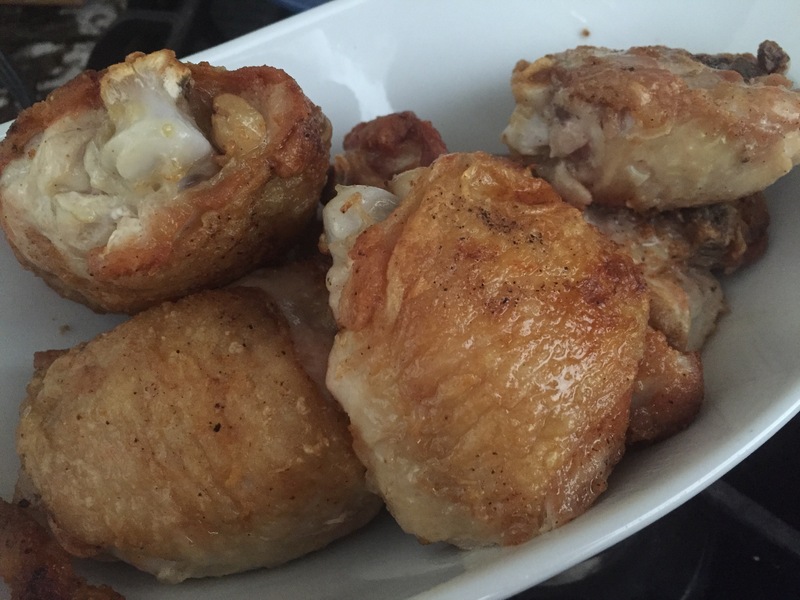 We do chicken thighs often and I’m always looking for new flavor ideas. That looks delicious! 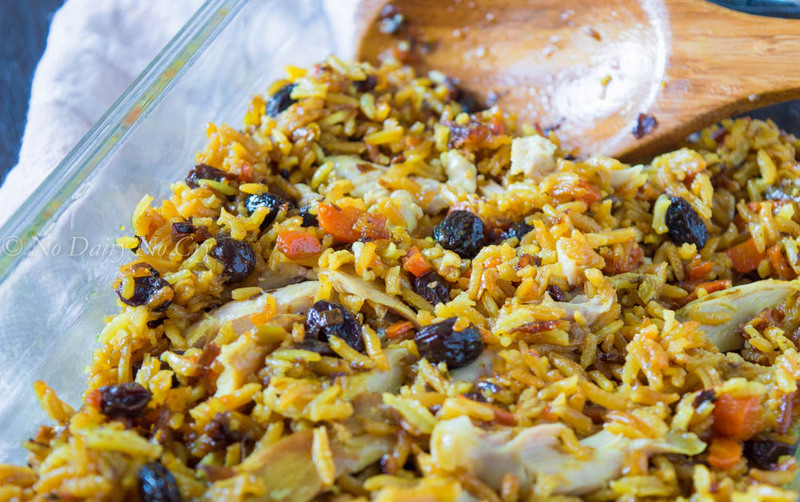 I love one pot chicken and rice dishes!